i believe lots of you have tried cushion. it has been a popular product in Asia. me, myself have tried lots different brand but i haven't done any reviews. so, i have tried The Face Shop, Lancome, Laneige and Etude. first i'll review about Etude. Etude is my first cushion. 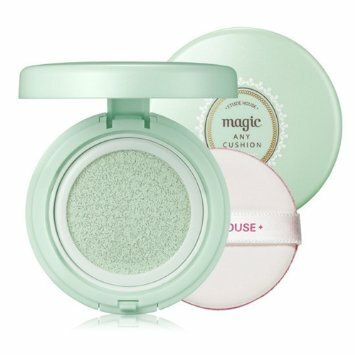 i used this mint green one because it has this color correcting that suit my reddish skin around my cheeks. this also brighten up your skin. if you have reddish but darker skin tone, i suggest not using this one cause it'll make your skin looks ashy. 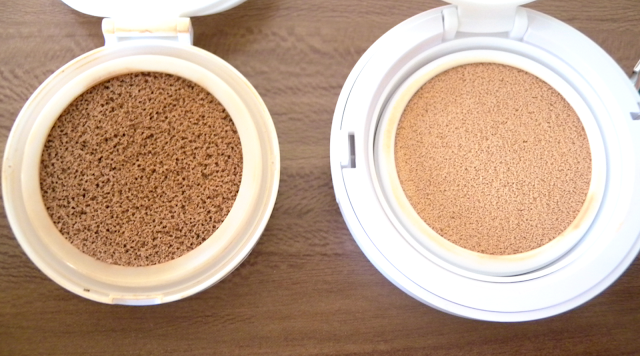 for coverage : light to medium. The second one is Laneige. what i used is Snow BB Soothing Cushion. Laneige cushion is quite popular among Indonesian people. so its definitely worth it. i've been loving this one for quite some time. 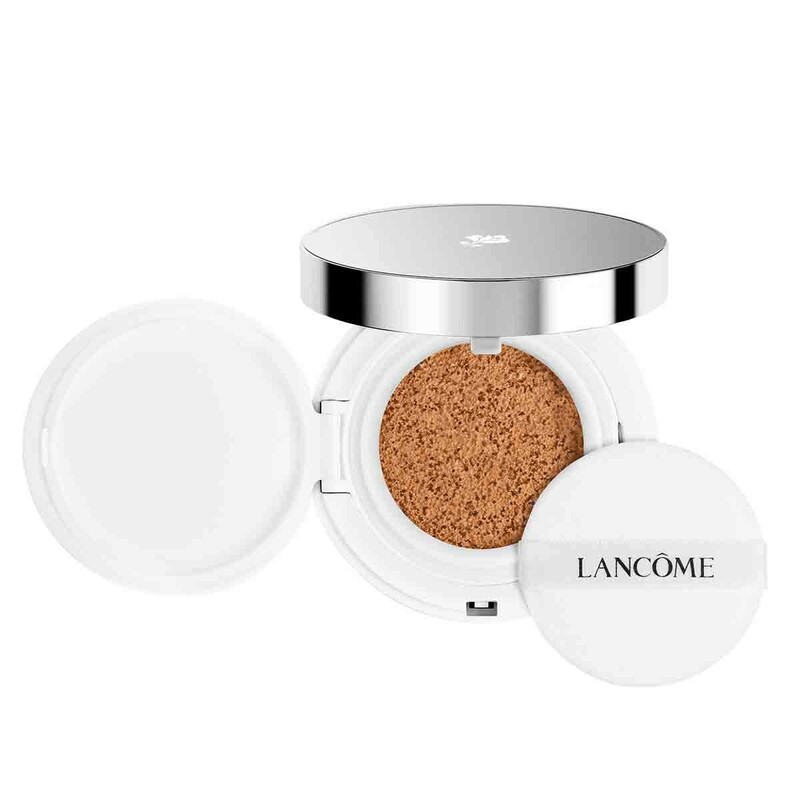 its more pricey than Laneige but it has like a whole lot more than the other brand. for coverage is medium to heavy. then this one is yours to choose. it has so many shades, 8 if im not mistaken. but, too bad it doesn't provide darker tone in Indonesia. Last one is The Face Shop. 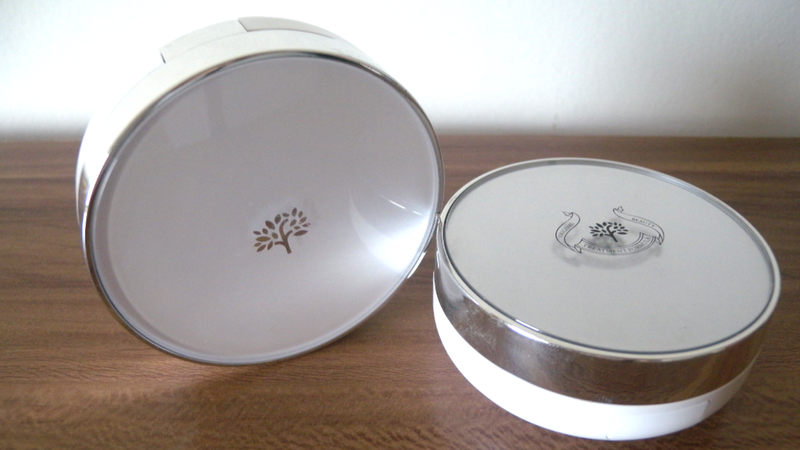 i have to say i'm new to this cushion cause i rarely buy The Face Shop products. so i brought my other brand empty cushion and traded it with the new TheFaceShop cushion. 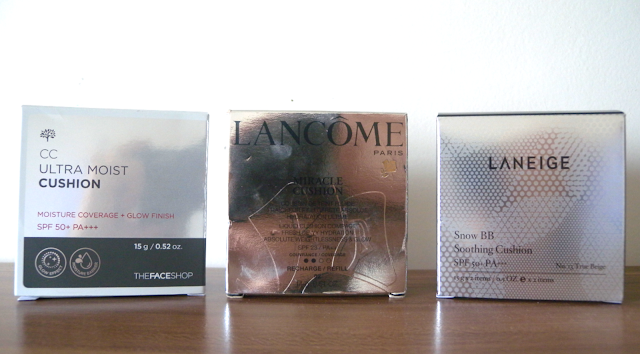 pic on the left is the last packaging model. and the right one is the newest. it came with 2 kinds of cushion. Ultra moist and Intense cover. 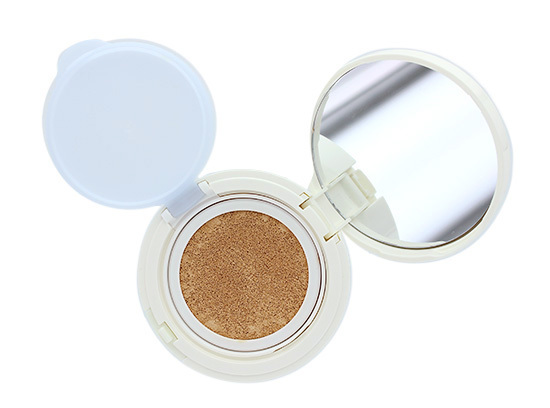 since my skin doesn't really have too much blemishes, i choosed Ultra Moist one for more light and glowing finish. for Intense cover, coverage is medium to heavy. both finish with glowing skin. now this is the different of Lancome and The Face Shop. i love both but i just want to show the difference. Lancome cushion has larger pore than TheFaceShop. it also has more liquid than TheFaceShop which makes it last longer. but because its so wet you have to really be careful while pressing it with sponge cause if not, you can see you'll make it look dirty and some products might get to your nails / finger. but in the end i love them all. for more everyday look i say Laneige is better. but for more coverage, Lancome. 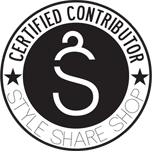 i have discount code for you to shop at Sociolla. Click Sociolla Banner on top right side of my blog. i thought it will arrive like 3 to 4 days but i was totally surprised. cause the next day someone knocked my door and it was Sociolla delivery guy and yes my Cushion landed safely on my hand with their cute signature packaging just in time on my sis birthday. and let me know which cushion is your favourite. 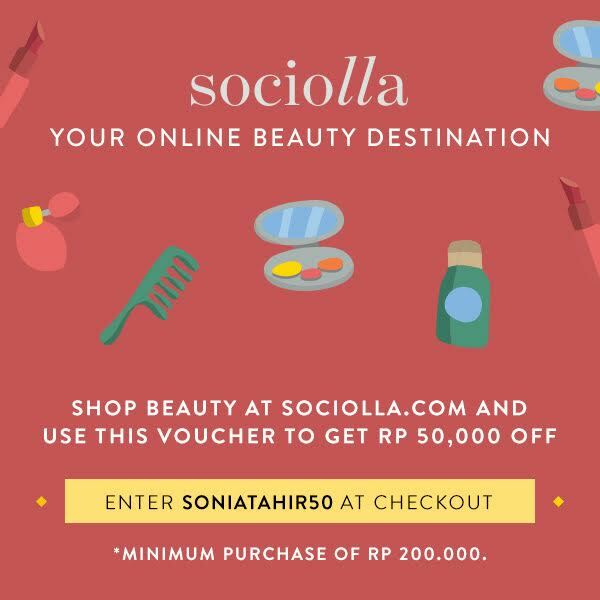 Sonia, reading ur post ini jd wondering when is the best step to apply bb cushion? 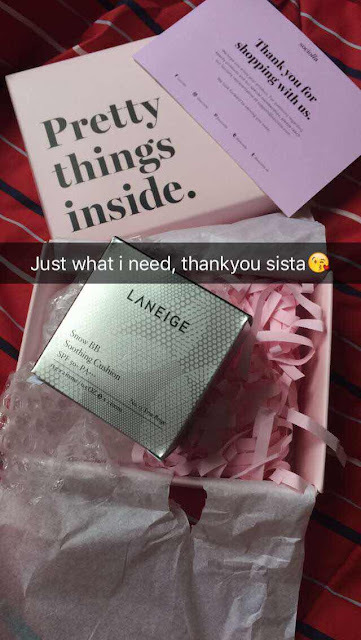 and stlhnya perlu di set powder lg kah? hello ci, apply bb cushion after skincare. 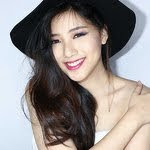 and if you want it to stay more longer, then appply primer after skincare first, then bb cushion, following with setting powder to make sure it's not greasy or sticky if you have oily skin.